Human resources and hiring professionals have both training and experience that influences hiring processes and how applicants are screened. Certain business practices may also affect how an applicant goes from being recruited to interviewed to background check to job offer. With over a decade of experience in assisting hiring decisions, the VeriFirst staff has seen it all and we hope to pass that knowledge to you. 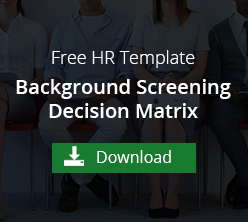 Do you know when other hiring professionals conduct background checks? Is it before or after the interview? Or after the job offer? Recruiting and hiring is constantly changing with the effects of the economy, the job market, regulations about criminal background checks and more. You, the reader, are on the front lines and have insights to offer your fellow hiring managers. We write about best practices every day and couldn't do it without your help. Take our short 5-question survey below and we'll share results in an upcoming blog post. THANK YOU!